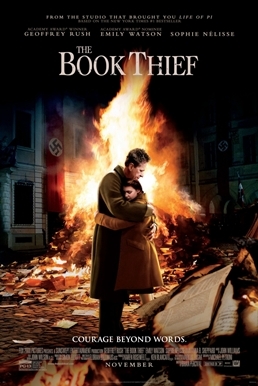 Markus Zusak’s critically acclaimed novel about a girl and her life in Nazi Germany was always bound to be made in to a film sooner or later, and it’s Brian Percival that took up the mantle as director to adapt it. Having not read the book it’s hard to say how the adaptation comes across, but it definitely feels like Percival’s heart is in the right place even if he doesn’t do the award winning material the justice many will think it deserves. The project was definitely an ambitious one, since the use of many devices in the book do not transfer to film so well, and Percival does at times struggle with quite what to do with them, often resulting in the film feeling a bit jarring and disengaging while managing to grab you for flitting moments of time. One main problem with the adaptation is its insistence on overusing tropes of the genre, developing an overly saccharine tone that serves to make one scoff rather than engage properly, and its unabashed relentless pursuit of these schmaltzy ends means that to some extent we view the characters as mere caricatures fashioned from other stories rather than individuals of their own, and their story, which often times is not told to us anyway, is not as interesting as a result. Sure, some relationships are built by the quality of the performances. Geoffrey Rush and Emily Watson, even in spite of the latter’s strange decision to continue with a strong German accent, are very good and as a result their interactions feel a lot more real and a lot better at drawing you in than with some of the characters, who are wooden in comparison or just don’t fit at all, much like Death’s oddly disconnecting narration as voiced by Roger Allam. A mention must be given to Sophie Nélisse, who is very strong as the lead character Liesel and has a great career in front of her if she’s this believable by the young age of thirteen. Ultimately it seems that Percival’s adaptation loses something in the transition from the page to the screen, and isn’t anywhere near as poignant as it so dearly wants to be. 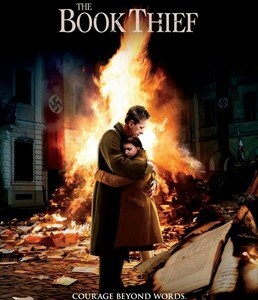 As a sweet story of a child’s resistance to a despotic regime it just about has enough to get it through, but it treads lightly on any deeper exploration of Liesel’s environment and life in Nazi society, instead going for a good old-fashioned tug on the heartstrings with your checklist of romance and innocence and with interactions that are engineered with the express purpose of ensuring you shed a tear. It inexplicably fails to generate any real tension from its tension-filled setting as a result which is a massive misstep, but at least it’s wonderfully filmed throughout with cinematographer Florian Ballhaus ensuring that every frame shines, and it has just enough in terms of its presentation and in its performances to endear you to it and make it a watchable if disappointing experience, particularly if you were expecting something as revelatory as the book is touted to be. A missed opportunity overall, but it’s always worth seeing Geoffrey Rush at his best in a strong albeit underused and marginalised story.